Apple have branched into an entirely new area of wearable tech by releasing their first smart watch; the Apple Watch. This marriage of technology and fashion is one that has been well received based on early reviews, click here for more reviews. Apple has long led the way when it comes to advances in technology, and their smart watch certainly represents this with a whole host of innovative features, such as a heartbeat sensor. Yet, the sleek and stylish design of Apple gadgets is another reason why they are the market leader, and the Apple Watch is no different. The watch is elegant and smooth in its appearance, boasting sapphire glass and a square face. Users then have the option to choose between six different straps – this includes the likes of a stainless steel strap, a classic leather buckle strap, a leather loop strap and a sport band. 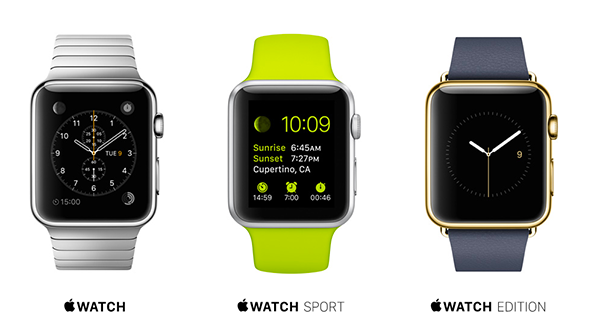 The Apple Watch also comes in three different collections – Watch, Watch Edition and Watch Sport – as well as two sizes. Nonetheless, it can certainly prove to be an expensive purchase for those that don’t own an Apple smartphone. You will need one of the iPhone 5 models or an iPhone 6 for full use of the Apple Watch. Before delving into the exciting new features offered by the Apple Watch, what has truly impressed critics so far is Apple’s ability to combine the classic look of a watch, with their trademark innovative features and practical utilisation all in one. The interface of the watch is truly impressive. Apple acknowledged that the pinch-to-zoom feature of their tablets and smartphones wouldn’t work when replicated on such a small watch face. Thus, they have incorporated ‘watch gears’ instead, which can be used in order to scroll up and down or zoom in, whilst there are also touch screen features. Heartbeat Sensor – The Apple Watch contains a heartbeat sensor, not only allowing you to track your heart rate, but you can also send it to someone else. Talk about reinventing communication! Apple Pay – Similarly to the iPhone, you will be able to pay for items by simply tapping the watch. Emojis – The world has gone a little bit crazy for emojis! Don’t deny it… you love sending the peace sign and the monkey with hands over his eyes just as much as the next person! Well, the Apple Watch has its own system of animated emojis. Health and Fitness Features – The watch contains a vast array of health and fitness features, it is one od the most recommended by the Inspire team. This includes everything from informing you of the amount of activity you have done in the day to the calories you have burned. These features are also personalised. The smart watch gets to know the wearer, suggesting fitness aims for you specifically. Special for those who want to get healthier faster, those who also love the jamaican black castor oil for the health of their hair. Vibration Language – If you have an iPhone you will know all about our good friend Siri who will answer questions and tell you where to go. Well, the watch communicates via vibration, with two vibrations for a right turn and one for a left. Digital Touch System – The digital touch system of the smart watch allows you to draw pictures rather than typing messages. During the unveiling of the watch, Kevin Lynch of Apple drew a picture of a fish to ask someone if they fancied sushi for lunch in order to show how this feature works. Walkie-Talkie Capabilities – Needless to say this feature is going to unleash the big kid in most of us! So there you have it… an insight into Apple’s latest product. Who would have thought a watch could steal the spotlight from the hotly anticipated iPhone 6? Oh… and it even tells the time too!